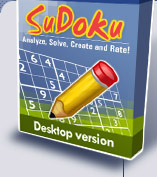 Do You SuDoku ? NEW Desktop SuDoku! Based upon our Award Winning** Mobile version*. The following reviews are for our Mobile version however the Desktop version is exactly the same. This is the Desktop version for Windows XP and Vista. Pocket PC and Windows Mobile versions also available. SuDoku Solver - Solve any SuDoku puzzle in less than 1 second ! Designed with the help of over 200 SuDoku Players. NB This product uses Microsoft's Latest Framework Technology. Please ensure you have the latest Framework installed (Download V1 HERE or else get the latest version via Windows Update at www.Microsoft.com).